We'll have highlights of the Fir Park action on the website at midnight. Thanks very much for your company this evening. I hope you can join us again on Saturday and Sunday. Good night. Jim, Paisley: "St Mirren have only themselves to blame for inconsistent, hope Motherwell stay up they have been battling." Debbie, Paisley: "I'm a totally gutted St Mirren fan!!!!! The team had already given up but I want to see them fighting for the last 3 games!!!" Iain, Howwood: "St Mirren finally being put out our misery, board need to take the lead and get managerial situation sorted quickly to get a massive team rebuild underway, as it stands we'd struggle in Championship as well." David, Moray: "Are Kilmarnock doing what Hibs did last season? On the slide, downhill momentum, no confidence, no wins -- easy meat for QoS to beat in Play Off!" "At the end they caught us with a sucker punch. With the run we've been on we've not got time to feel sorry for ourselves. Next Saturday we have a tough game against Partick Thistle. But it's still in our hands. It's a poor run of results. That's what has put us in trouble. We can't afford to give the goals away that we're doing at the moment. When you're in this position you need big characters on the pitch." "To a man, they were magnificent. I am disappointed with the goal. At 2-0 it's never an easy situation. Next weekend's game (at St Mirren) is the next big one. It doesn't matter if a team is relegated or not. It might free them up. If we take our foot off the pedal we'll get hurt. I do (think we can survive). I'm a big believer. People do silly things at these times." "Lee (Erwin) is a great talent and he is a pleasure to play with. He is taking in what the manager is telling him and he can only get better. We can only concentrate on what we need to do and that is win the next two games. (Next opponents) St Mirren are down now but they can play with a freedom. It's going to be tough." Those three points lift Motherwell to 35, 11 points ahead of St Mirren who have only three games to play. St Mirren are relegated. 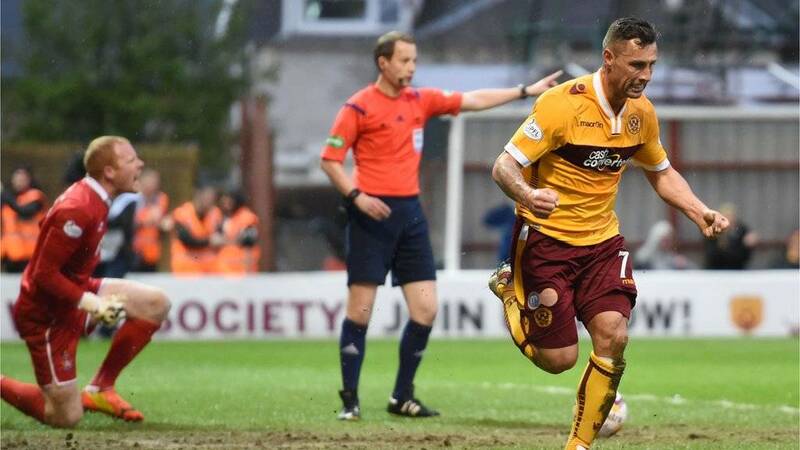 Motherwell put pressure on Ross County and Kilmarnock above them in the table as the trio try to avoid the Premiership play-off final against Hibernian, Rangers or Queen of the South. Ross Barbour and Marvin Johnson receive treatment for a head clash. St Mirren are on the brink of dropping in to the second tier of Scottish football. Greg Kiltie goes agonisingly close to scoring for Killie with a fizzing deflected shot just past George Long's post. Scott McDonald makes a terrific diagonal run out to the right in the Kilmarnock half and releases Lionel Ainsworth, who slaps a left-foot shot past Craig Samson to surely seal the points. Scott McDonald is a few inches wide of scoring Motherwell's third, his curling free-kick slipping past Craig Samson's right-hand post. Ian Baraclough makes a change for Motherwell, as Lionel Ainsworth comes on for Conor Grant. Killie's Darryl Westlake is next to be booked, for a late challenge. Motherwell have a free-kick 20 yards out in a central position. Kilmarnock are staring a seventh consecutive league defeat in the face. And St Mirren are five minutes away from relegation. Kilmarnock's Jamie Hamill instinctively throws his hands up to cover his reddening face as he completely misses the ball with his left-foot - he nudged it forward a fraction with his right toe just before his embarrassing error. Thankfully, both players are back on the pitch. Just over 10 minutes to go. Can Kilmarnock find an equaliser? Ross Barbour and Marvin Johnson have a nasty clash of heads - both look groggy and we'll need to wait to see if they are OK to continue. Motherwell captain Keith Lasley has one of those shots that, like anyone over 40 taking a seat after a long day, produces an involuntary groan. He tugs it wide from 20 yards; just didn't catch it properly. On-loan Everton player Conor Grant cracks a shot straight at Craig Samson from 12 yards. It's a decent save by the Killie goalie but Grant really should have tried to pick a corner. Killie's Jamie Hamill and Stephen Pearson are booked - Manuel Pascali was looking a bit sheepish there, waiting to see if he'd be punished for clipping Scott McDonald. Lee Erwin is ruled offside, much to the annoyance of the home fans, after he ran from the halfway line to get on the end of goalkeeper George Long's clearance. The linesman said Erwin had already strayed offside when the ball was released. Killie skipper Manuel Pascali is booked by referee Willie Collum for a challenge on Marvin Johnson. Josh Magennis got the last touch to the ball to knock it over the line to give Killie a lifeline in the match. And suddenly the Motherwell passes are going astray. Is it nerves? That was two errors in the space of a few seconds. Killie's Paul Cairney is back up on his feet after taking an accidental bash on the nose. Kilmarnock have a different attitude to the match now, it would seem, and Josh Magennis is at the back post to poke the ball home and make Killie, St Mirren and Ross County fans feel a little bit happier. George Long is put under pressure by a pass-back by Mark O'Brien but he manages to hoof it clear just in time. Relief on the face of Motherwell manager Ian Baraclough as his side move two ahead. Kilmarnock manager Gary Locke has made two changes at the break in a bid to turn things around. Tope Obadeyi and Greg Kiltie come on for Sammy Clingan and Rory McKenzie. Motherwell get the second half under way, leading by two goals to nil. Can Kilmarnock produce something special in the next 45 minutes? St Mirren fans will be feeling ill watching this game. Remember, a win for the Steelmen sends them down to the Championship. And Ross County supporters will be in a sweat - as things stand, they are only three points clear of Motherwell, though the Staggies will have three games still to play while Motherwell will have two. Seeing re-runs of the first-half action, Motherwell should have had a penalty when Killie's Darryl Westlake handled the ball in the penalty box. Both of Motherwell's goals have come from their desire to have a go at Kilmarnock. They look the hungrier side, Well. Lee Erwin cuts inside Lee Ashcroft before thumping home Motherwell's second goal. The Motherwell players congratulate scorer Scott McDonald, knowing how important the goal could be to their Premiership survival. "Kilmarnock are fighting a rearguard action and they cannot get out of their own half." What a peach of a goal by Lee Erwin. He and Marvin Johnson look in the mood tonight, attacking Killie at every opportunity. Stevie Hammell wins the ball from Josh Magennis and plays in Erwin down the left, and he turns Lee Ashcroft inside out before cutting the ball on to his right foot and lashing it home. Skill and desire on show there. Motherwell Scott McDonald runs off to celebrate scoring against Kilmarnock keeper Craig Samson. Four Motherwell players gather to receive Marvin Johnson's corner kick from the left. Three run to the front post, one to the back, but the ball falls to the visitors. Ian Baraclough's side look the more likely to score the next goal. Killie defender Lee Ashcroft escapes his marker in the Motherwell box and heads a corner kick down into the turf and wide rather than past George Long for the equaliser. Kilmarnock's Lee Miller goes in for an aerial challenge against Motherwell's Mark O'Brien. Lee Erwin shows bags of enthusiasm to attack the Killie defence and weaves his way through before releasing a fierce left-foot shot. Craig Samson saves well at his left-hand post but the Australian striker Scott McDonald is on to the loose ball in a flash to poke it home. Johnson is seeing plenty of the ball out on the left for Motherwell. He is constantly making himself available for the pass. Motherwell need more of that. Striker Scott McDonald, fresh from remonstrating with referee Willie Collum over his failure to award a free-kick, stoops to head a clipped Marvin Johnson at the Killie goal but sends his attempt wide. Conor Grant's well delivered corner kick from the right is cleared by Killie's Josh Magennis. Killie crank up the pressure as Josh Magennis cracks in a low shot from the right-hand side of the box. It takes a deflection on its way through to George Long, who makes a save with his feet. Sammy Clingan follows up with a shot wide of the target from 22 yards. Kilmarnock's Sammy Clingan and Fir Park favourite Keith Lasley collide in midfield but I don't think there was malice in that. I reckon the Northern Irishman slipped. Kilmarnock manager Gary Locke passes instructions to his sheepdog to organise the Ayrshiremen's defence. Scott McDonald's long-range shot is nowhere near the target but the Motherwell striker perhaps was just reminding Kilmarnock that they're not going to get things all their own way this evening. Kilmarnock's Paul Cairney draws a good save from George Long after he got the end of Josh Magennis's cross - his side-footed attempt was placed more than blasted. It's a good start by Gary Locke's men. Kilmarnock, in their change strip, kick off the match in Lanarkshire. Motherwell are lining up 4-4-2, while the visitors are in a 4-4-1-1 formation. The teams are out on the pitch. What a big match this is, especially for Motherwell. "We've still got two games after this and we're still in the driving seat but this could put everything to bed. The players are well aware what's at stake. It's important we put on a good performance." The kick-off is in eight minutes' time. Motherwell: George Long, Ramsden, O'Brien, McManus, Hammell, Grant, Pearson, Lasley, Johnson, Erwin, McDonald. Subs: Ainsworth, Sutton, Twardzik, Kerr, Moore, Dominic Thomas, Straker. Kilmarnock: Samson, Barbour, Ashcroft, Pascali, Westlake, Cairney, Hamill, Clingan, McKenzie, Magennis, Miller. Subs: Connolly, Johnston, Brennan, Obadeyi, Eremenko, O'Hara, Kiltie. Kilmarnock manager Gary Locke opts for experience as his side look to secure their Scottish Premiership safety and end a run of six consecutive defeats. Daryl Westlake, Jamie Hamill, Paul Cairney and Lee Miller come back into the team with young players Mark O'Hara, Craig Slater and Chris Johnston dropping out alongside playmaker Alexei Eremenko. Motherwell make one change as Simon Ramsden replaces the absent Josh Law at right-back. So, a win for Motherwell relegates St Mirren and brings them closer to 10th-placed Ross County, who are six points ahead. This is how the Scottish Premiership's bottom six looks like ahead of this evening's match at Fir Park. Good evening and welcome to BBC Scotland's coverage of the Scottish Premiership match between Motherwell and Kilmarnock, both of whom would be mightily relieved to win the game.